The Department of German at New York University cordially invites you to its two-day Graduate Student Conference, “Work/Ethics,” set to take place on December 6-7, 2013. Our conference brings together a number of outstanding graduate students from the United States and abroad and will feature a keynote address by Professor Martin Jörg Schäfer (Universität Erfurt) and a round table discussion with Professor Avital Ronell (NYU). The notion of work is as significant for the understanding of modern society as it is inherently ambiguous. The spectrum of conceptions range from the curse of toil in Genesis, alienated labor in Marx, the ‘iron-cage’ of modern work ethics in Weber to the anthropological revaluation of work in Locke and its world-building, cultivating function in Hegel, Heidegger, and Arendt. Its repercussions pervade literature, the arts, philosophy, and psychoanalysis as thematic work, conceptual exertion, dreamwork, the work of mourning, working through, or the very notion of an œuvre. Our conference seeks to elucidate the slash between work and ethics in examining different configurations of work, labor, operativity, productivity and their opposites (if such a thing exists): non-work, doing nothing, leisure, idleness. Please send questions to Jerome Bolton (jib247@nyu.edu). No RSVP is necessary. We look forward to seeing you! Be sure to check out the upcoming Humanities Initiative event featuring our very own Robin Nagle, discussing her new book, Picking Up! Did you know that New York City generates 11,000 tons of trash every day? 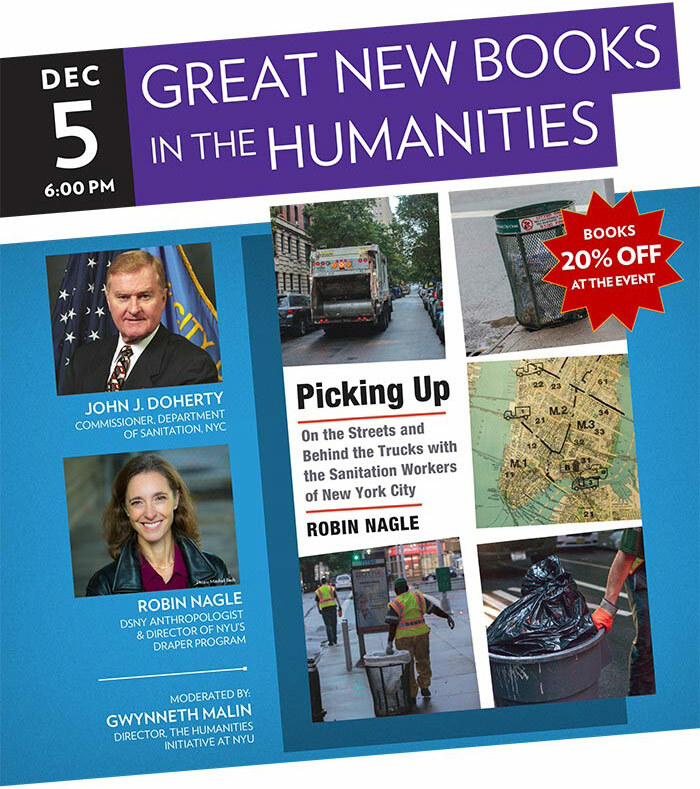 Join us for a dialogue with NYC Department of Sanitation Commissioner, John Doherty, andRobin Nagle, author of Picking Up: On the Streets and Behind the Trucks with the Sanitation Workers of New York City. We will explore the people and infrastructure that powers New York City’s trash collection operations every day. The conversation will be moderated by Gwynneth Malin, Director of the Humanities Initiative at NYU. Picking Up: On the Streets and Behind the Trucks with the Sanitation Workers of New York City will be sold at 20% off at the event. © 2013 The Humanities Initiative at New York University, 20 Cooper Square, Fifth Floor, New York, NY 10003. Make sure Humanities Initiative e-mails are delivered: Add info@humanitiesinitiative.org to your address book or safe-sender list. This email was sent to maggiel@nyu.edu. You received this email because you are registered in the NYU Humanities Initiative database. We respect your privacy. To unsubscribe, click here. In the last two decades, the study of exhibition history has grown exponentially: a recent surge of publications, conferences, courses, and reconstructions of historical exhibitions has fostered a new body of knowledge. However, discussions on exhibition history are conspicuously bifurcated, shuttling between a small coterie of curators on the one hand, and a select number of scholars on the other. In curatorial circles, discourse often focuses on individual practices, with little sustained reflection on broader historical and museological implications. Meanwhile, in academic circles, the history of exhibitions is often situated in terms of spectatorship, without directing attention to the various forms of authorship involved in exhibition making. This conference seeks to sketch a typology of authorial roles in contemporary exhibition practice by assembling a range of perspectives-artists, curators, art historians, and emerging scholars-for a day-long conversation. Conference funding provided by the John Rewald Endowment of the Ph.D. Program in Art History, and The Center for the Humanities at The Graduate Center, CUNY. Interested participants are invited to submit a paper no longer than 3,000 words along with a CV to nmusteata@gmail.com by Friday, January 10, 2014. Monday, November 25th, 6:30 p.m.
Book launch of Friedrich Nietzsche’s The Dionysian Vision Of The World from Univocal Publishing: A conversation between NYU professor and Nietzsche scholar Friedrich Ulfers and Nietzsche translator, Ira J. Allen. Copies of The Dionysian Vision Of The World will be available for sale at a 20% discount at the event. Events at Deutsches Haus are free of charge. Please let us know which event you would like to attend by sending us an email to deutscheshaus.rsvp@nyu.edu. Space at Deutsches Haus is limited, please arrive ten minutes prior to the event. Thank you!